double-sheet detection and control as well as an inventory-management system. In contrast to conventional high-rise rack stacking systems with drawer technology, with IntelliStore blanks are stacked on and destacked from shelves via single blank access. A core component of the system, KISS (Kemper Intelligent Storage Software) records all data of the stored inventory as well as the single blanks (manufacturer, batch, dimensions, type of material). Key to IntelliStore is the UDK double-sheet-detection system from Roland Industrial Electronics, L.P., Cleveland, OH. To ensure that during destacking only one blank is taken with the custom-designed vacuum grippers, the blanks must be checked for double-sheet conditions. The UDK20 can detect blank thickness and type of material with a single probe sensor at the time of blank storage. This information routes to memory storage to become a part of KISS. 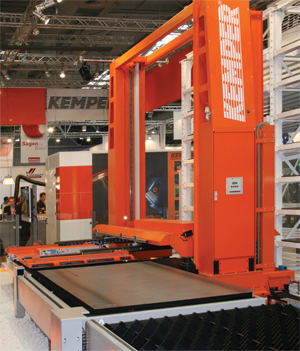 During destacking, the UDK20 automatically checks the blanks for double-sheet conditions, ensuring that only the desired blank is destacked and transported for further processing. See also: Roland Industrial Electronics L.P.